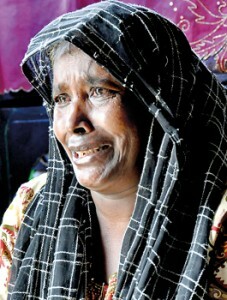 Families living in dwellings in Colombo North lament that they are the forgotten people. New pavements, new roundabouts, restoration of old buildings; Colombo city is undergoing a metamorphosis and is the centre of a beautification programme. But look to the north of the city, it’s starved of development. Although the north of the country was liberated after a three decade-long conflict, certain areas of Colombo north are still in the grips of poverty and squalor. Neglected by government and non-governmental development agencies, vocational training institutes, welfare organisations, women affairs, child care and family planning organisations, the families in these areas struggle to meet their daily needs. 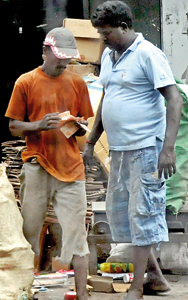 The Sunday Times saw hundreds of such families in Modera, Mattakkuliya, Grandpass, Bloemendhal, Dematagoda, and close to Peliyagoda living in low-income dwellings, made of wood and rusted metal roofing sheets. “I have five sons, all in their teens. After my husband left us I started selling camphor to feed the family. Three of my sons are school dropouts and are unable to find jobs. They call us the garbage dump people,” said Chamila Niranjani (48), from Henamulla nawa niwasa bordering a huge garbage dump in Colombo 15. Her eldest son Sajith Sanka (20) was preparing lunch while the other was making camphor packets for their mother to sell. She was worried about her sons as she said uneducated youth fell easy prey to illegal activities such as drug trafficking and robbery. After their previous abode, a little wooden house was gutted by a fire several years ago they moved to this area. Their living conditions turn into a nightmare during the rains with water from the garbage dump seeping into their one-roomed house. Many of the women try to earn a little income by making paper bags from discarded covers. Unfortunately, they have very few opportunities to sell their wares and they do not have any vocational training. Fifty-three year old Sithy Fowziya looks on with tear-filled eyes as her granddaughter Fatima hungrily eats a piece of bread, with some leftover curry, a proper meal after two days. Her husband and son have lost their jobs as street vendors with their shops being removed. Now they go from door-to door selling their wares. There are days the family has to survive on a mere Rs. 50 to Rs. 100. Devika Priyadharshani her husband and her three children manage on an income of between Rs. 200-Rs. 300 a day. They live in Stadium gama in Grandpass, that gets submerged during the rains as the drains get blocked. “My husband is a labourer earning a daily wage. We cannot afford to maintain the house; our roof is in a dire state of repairs and when it rains the house fills up with water. We are like the outcasts of Colombo, although we have been here since the day we were born,” she lamented. The small houses, mostly made of wood, bordering a canal adjoining the harbour entrance in Colombo 15 go under water with the slightest rain. The huge garbage dump close to the Henamulla Nawa Niwasa scheme. “The water level rises to about seven feet and our houses get inundated. Our children cannot go to school. Politicians come here only during elections with promises of housing schemes,” M. Annapaikyam(43), a mother of four said. The situation is the same for those who live in low-income dwellings near the Kelani riverbank. These slums situated at the entry and exit points of Colombo have been an eyesore to the city for many years. “Most of us don’t have samurdhi benefits nor do we get any vocational training. 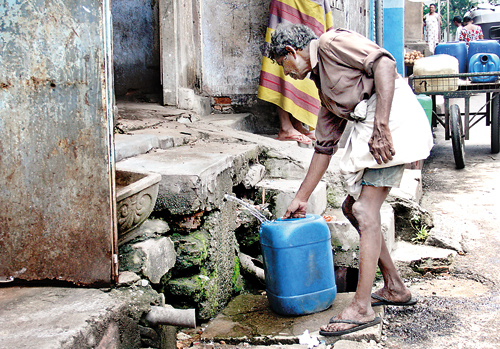 We have been living like this for years,” Shantha Gamage (37) from the area said.